Bright red and deliciously tart, rhubarb is a fantastic spring fruit. Here, 7 delicious desserts to make featuring rhubarb. Cooked rhubarb pairs perfectly with soft goat cheese. These fantastic over-sized muffins are perfect for breakfast. 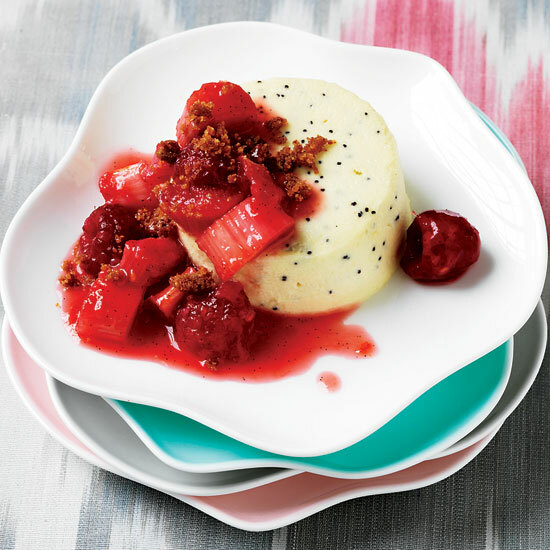 Rose-scented rhubarb and honeydew melon star in this refreshing dessert. This version of the classic Austrian pastry is made with a cheesecake-like mixture and tangy rhubarb compote. Star chef Jean-Georges Vongerichten's tart is irresistibly tangy, creamy and frothy. Alice Waters's fast dessert is delicious warm or at room temperature. These crispy fritters are served with warm sweet-tangy compote.